Bernhard Langer is a German professional golfer. He is a two time Masters champion, and was one of the world's leading golfers throughout the 1980s and 90s, being the first official number one ranked player in 1986. 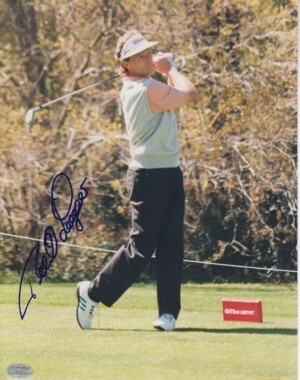 Bernard Langer has hand autographed this 8x10 Color Photo. Mounted Memories Hologram and Certificate of Authenticity.